HomeBlogDisplay AdvertisingWhy use Google Smart Display ads? Smart Display uses machine learning to examine your brand’s history and uses data signals on previous user behaviour to find the perfect match between interest and relevance to drive conversions. According to Google, the main benefits of a Smart campaign are that “they offer a much simpler campaign construction flow, a friendlier interface to manage your ads and a new, streamlined way of tracking your progress”. What content can you include in Smart Responsive Display ads? You should supply as many as you can, as Google says responsive display ads (RDA) with multiple headlines, descriptions and images get 10% more conversions, while those that used RDAs alongside standard image ads get 50% more. Best practice is to repurpose image assets and copy from existing high performance ads. You can scan your images from social media platforms (LinkedIn/Facebook/Twitter/Instagram), or scan from your website directly – this is great as it’s way more efficient! What would you say is the main benefit of using Smart Display advertising? The time you can save. 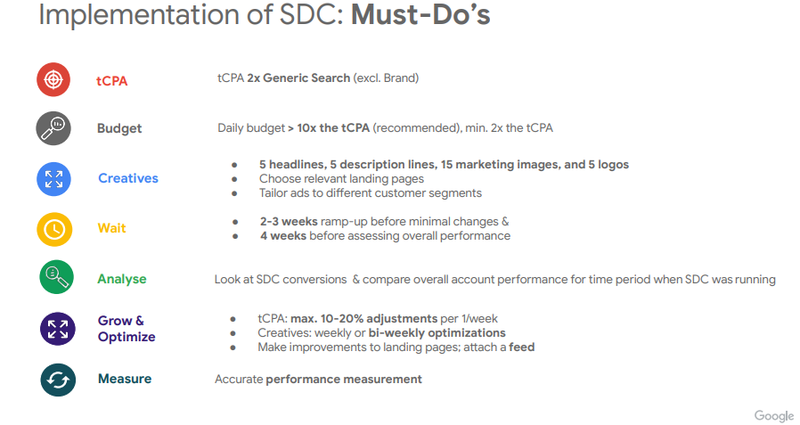 The campaigns are easy to set up: you provide your creative assets, target CPA (cost per acquisition) and daily budget, and Google automatically does all of the work in optimising your ads. As the campaigns are responsive, Google selects the best combination of assets, which gives you important data on which of your headlines, descriptions, images and logos perform best. Google told us that 80% of digital marketers’ time is spent on manual tasks, only 20% is spent on strategy. However, 75% of advertising impact is determined by creative quality, so being able to shift your time from tasks like bidding to concentrate on the important stuff – the things that actually influence user behaviour – is a massive benefit. Plus, the performance data means you don’t have to waste time creating and testing creatives that aren’t going to work. Which feature stands out the most for you? 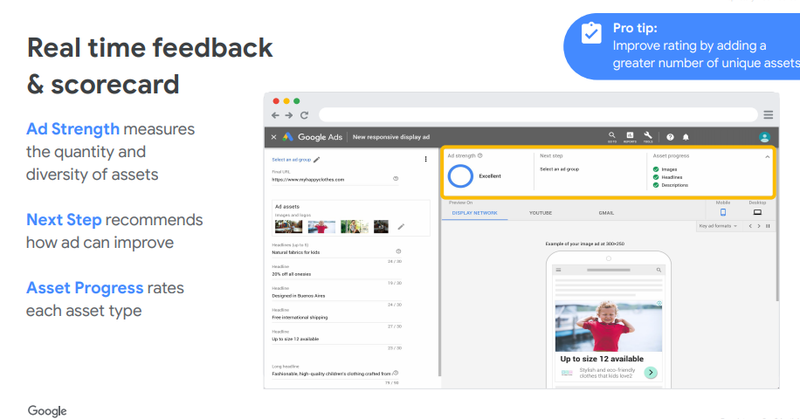 I really like the fact that Google gives you real-time feedback, along with a scorecard that rates your as Good, Poor or Excellent and tells you how you can improve your ad. The quality and range of assets you upload to your ad has a big influence on this. Another improvement I like is that Smart Display campaigns include a Pay for Conversions billing option (which, as the name suggests, means you only pay after receiving conversions), which now has low eligibility requirement (currently in beta) – just five conversions across the account over the past 30 days, much lower than the previous Bid Strategies requirement of 50-100 conversions. Who would you recommend Smart Display advertising for? I think a good choice for you if you want to reach customers beyond your manually targeted campaigns, or if you’ve been concentrating on remarketing and are looking to reach customers earlier in the buying funnel. Having said that, if you’re an advertiser who’s got highly segmented RLSA lists, it’s better to continue with your existing campaigns while trying out Smart display campaigns. It’s could also be a good call for those who are new to advertising on the GDN as it can take the fuss out of setting up and optimising campaigns. What’s the reporting feature like? Once live you have visibility of asset level reporting, which are rated Best/Good/Low based on audience engagement rates. Google suggests making no/few changes in the first two to four weeks of a new campaign to allow for significant testing. Plus, you should wait four weeks before assessing performance. Google plans to introduce more metrics in the future but there is no official timeframe for this yet. Smart responsive display ads also give you a Top Combination Report that helps you to understand perform the best together, based on engagement rates. We’ve put together a series of eBooks that will take you from zero to hero in paid search, taking you through through each facet of PPC to ensure your brand is making the most of its budget. Download the series for free today to start learning.